Do you have students who need more guidance on finding useful information online? 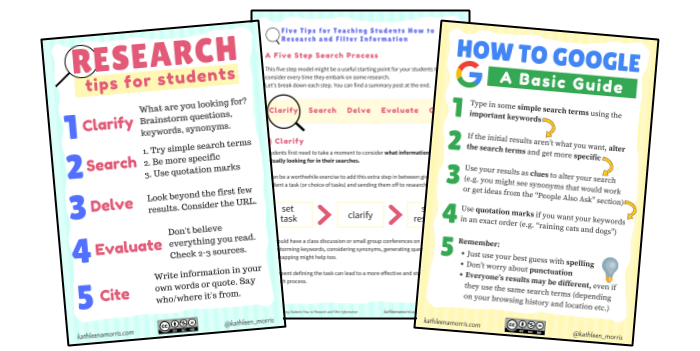 Earlier in the year, I published a popular post called Five Tips For Teaching Students How to Research And Filter Information. This is a comprehensive guide to teaching students of all ages how to research. Let’s zoom in on a particular part of the research process — evaluating websites. I don’t know about you, but I’ve found helping students to evaluate websites to be particularly tricky. There are lots of guidelines out there but I wanted to create a resource that reflects an effective and natural process, no matter what you’re researching or how old you are. Scroll down to find a printable flowchart for your classroom. Let’s remember that researching doesn’t just take place in schools and other educational institutions. You don’t just have to research for a project or essay. It’s something we all need to be good at to thrive in everyday life. the ability to identify, find, evaluate, and use information effectively. You’re probably always researching yourself? I know I am. At the nursery, I was looking for some plants for my patio area. I did some quick googling on my phone before buying to find out which plants would be most suitable. A cafe I was going to visit with my family was closed. I pulled out my phone to find some nearby kid-friendly options that matched everyone’s requirement. Research doesn’t have to be something you do on the fly either — during the week I’ve been researching different approaches to teaching global studies. These sorts of everyday scenarios would be great to explain to students. Help them realise that research happens everywhere — not just in the classroom. Students need to know that the best site for them is not going to appear at the top of their search results. Google’s PageRank algorithm is complex, and many websites use Search Engine Optimisation to improve the visibility of their pages in search results. Students also need to know how effective searchers behave. Google keeps track of this information and website owners can view it in Google Analytics. It helps them produce better content that will make people want to stick around. And it helps Google know which search results are popular and should be displayed higher up the rankings. Students should know that it’s natural to bounce off sites. People often skim sites and quickly leave if it doesn’t offer them what they want. In 2017, Brafton found that the average bounce rate for the sites they surveyed was around 58%. So more than half the time, people will leave a site almost immediately. Bouncing away from sites is a natural part of researching. You don’t want to just settle for the first result you come across. 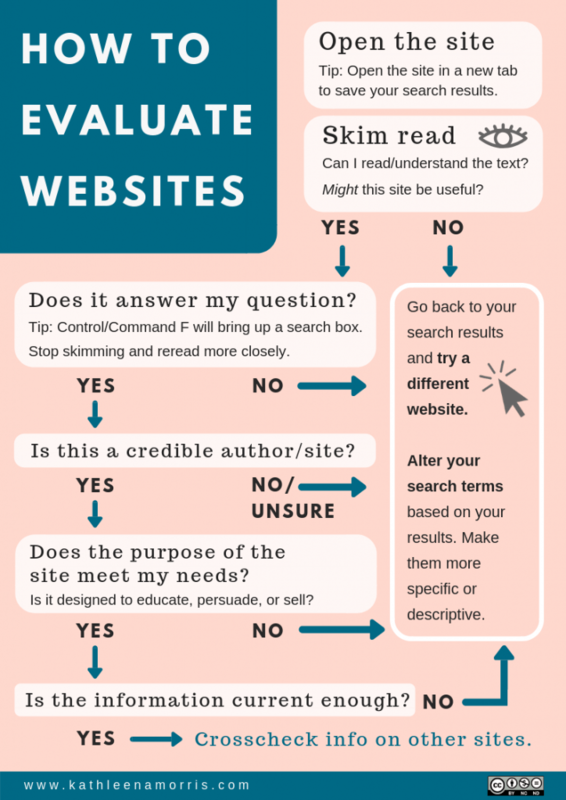 I’ve seen lots of resources and acronyms that are designed to help students evaluate websites, however, I haven’t seen something that describes an effective process. Furthermore, I think the first step is often neglected — if a student can’t read or understand a website then it is not useful for them. Feel free to download a copy of the flowchart and share it with your colleagues. I’ll elaborate on the key sequence below. The first thing students need to do is open the site. When looking through your Google search results, you may want to teach students to open sites in new tabs, leaving their search results in a tab for easy access later (e.g. right-click on the title and click “Open link in new tab”). It can also be worthwhile to explain the anatomy of a Google Search result and the benefits of looking past the first few results. I go over this in more detail in my guide to teaching students how to research. Next, skim read the site and determine whether you can read and understand the text. If it’s too complicated or difficult to understand, find another website. Decide whether this is the sort of site that might provide you with the information you’re looking for. If the site is difficult to navigate, cluttered with ads, or has other red flags like poor spelling or inappropriate content you might want to leave straight away. Skimming and scanning is the default way most people now consume new content so this now holds an important role in literacy education. A regularly quoted study from Nielsen Norman tells us that 79% of users always scan a new page they come across. Only 16% read word for word. Scanning and skim reading can be worth practicing in the classroom. E.g. give students one minute to look at text and then share what they think it’s all about. This is something that could be tried with emerging readers write up to higher level students. If you think the site might prove useful, you now need to find out if the information on the site actually answers your question. You could use a search box, navigation menu, or pull up your own search box by pressing Control/Command F. Type in the keywords you’re looking for. Stop skimming, and read more closely to see if this information is useful to you. If the information is there, you need to consider the credibility of the author or website. Can you rely on the information? Domain — sometimes domains that include .gov or .edu come from more trustworthy education or government sources. Author information — look at at the author bio or About page. How qualified is this person? Design — we can’t judge a book (or website!) by its cover but sites that are cluttered, difficult to navigate, or look amateurish may be worth avoiding. Sources — trustworthy articles usually link to other sources or cite where their facts come from. The next step is to think about the purpose of the site and whether it meets your needs. Is the author trying to make you think a certain way? Are they biased or one-sided? Are they trying to sell you something? Sometimes ads might not be so obvious, for example, blog posts can be written to promote a product. Is the author’s tone calm and balanced? Articles fueled by anger or extreme opinions are not going to be the best source of information. Do the headlines match the article? Or are they simply designed to hook readers? Is the author trying to educate the audience and present a balanced and factual picture? This is what you usually want. Finally, it’s important to consider whether the information is current enough for your topic. You can look for when the article was written or it might tell you when it was last updated. Sometimes URLs include dates as well. Does it matter how old an article is? Well, that might depend on your topic. For example, if you’re looking for the latest research on nutrition or a medical condition, the date might be very important. If you’re looking for some facts about World War One, it might not matter if the information hasn’t been updated in a few years. As the flowchart demonstrates, if you’re ever in doubt, just head back to your search results and try again. You might want to alter your search terms based on the results you’re provided with. Sometimes you need to change your keywords or be more specific. When you overcome all these hurdles and find some information that looks useful and reliable, it can be a good idea to crosscheck the information. So, have a look at a few other websites to see if they corroborate the information you’ve found. It’s important to remember that you can’t believe everything you read and it’s essential to consider multiple perspectives. Studies have shown that students find it difficult to discriminate between fake news and factual information. 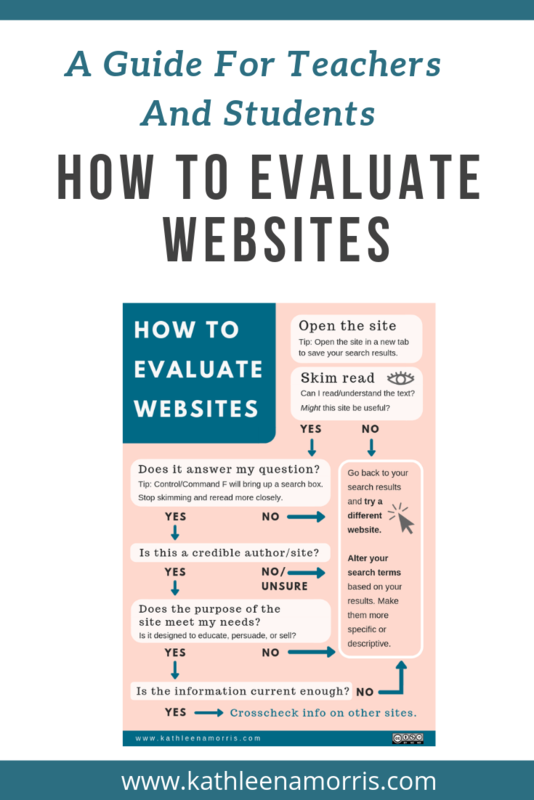 This is very important to address but not the only aspect of website evaluation. Like so many skills, website evaluation is something that people can become fluent at with practice. An important part of the process is thinking critically — not believing everything you read, not settling for any source of information, and always questioning. 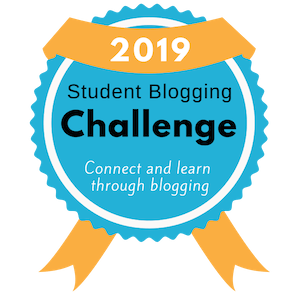 Students need to know that anyone can be an author and publish online nowadays (hopefully they’re already publishing online themselves through a blog or similar!). Like all aspects of teaching students how to research, classroom integration is key. You don’t need to spend large chunks of time on one-off lessons. Model your own searches explicitly and talk out loud as you evaluate websites. As you model, you could evaluate any old website or sometimes show a ‘fake site’ (check out Eric Curt’s examples of fake sites). When students can evaluate websites quickly, intuitively, and effectively, they’ll be on a path to thriving in and out of the classroom. Want to learn more about the topic of media literacy? Gail Desler has curated some great resources on her site Media Literacy in an Age of “misinformation”. What tips or ideas can you add to the topic of website evaluation? Is this something your students have struggled with? I’d love to hear from you! Scroll down to find the comment box. Want A Free eBook On Teaching Students How To Research? I’ve turned my popular post on researching and my 50 mini-lessons into an easy-to-read eBook. You can download it, print it, share with a friend, and read at your leisure. 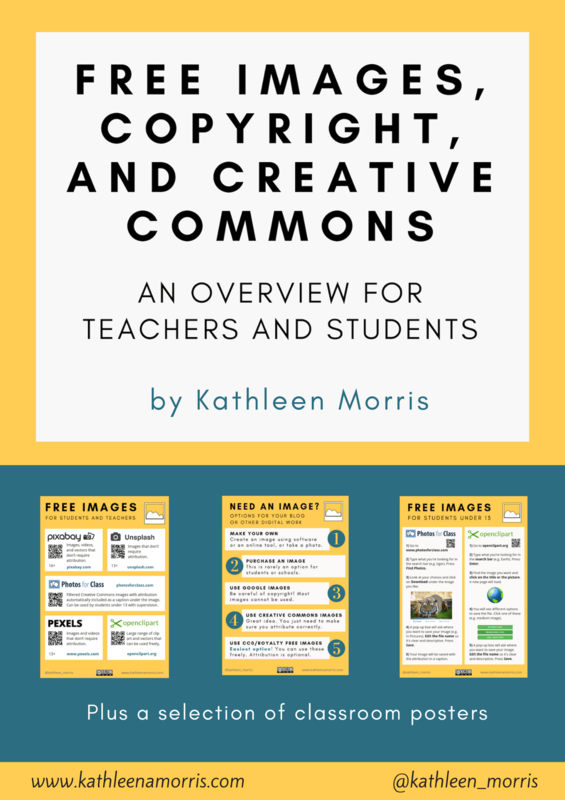 If you’d like this free guide, add your details here to sign up for my email newsletter and I’ll send it to you instantly! Alternatively, you can fill out the form below to get the PDF link in your inbox. I send out a newsletter twice a month to share my articles, resources, and other interesting tips and tools I’ve come across. Of course, you can unsubscribe at any time.